Do you remember being a kid and playing Super Mario Brothers? You know, you’d get to the boss and you’d basically finger mash all the buttons at once in hopes that you hit the right one at the right time and win? Well, maybe you didn’t play like that and maybe you were more strategic when it came to jumping on King Bowser’s head but sometimes tackling projects can feel like finger mashing all the buttons. Even the best strategies find us missing the jump, getting hit by stray shells, and losing time and value on our projects. How do you drive impact and increase value when chaos is always imminent? It’s never a matter of if scope creep will occur. It’s a matter of when scope creep will occur and when it does, will you recognize it? Will you adapt quickly enough? Will your project survive its influence? Can you still manage to deliver, keep everyone focused, up to date, account for distractions and be on budget and on time? We know you can. You’re the value creator — you’re here, reading this article, and Leantime is the tool to help you stay on top of it. How do you keep scope creep manageable? Leantime’s core premise is in helping you drive the impact you need to be MVPM (Most Valuable Project Manager). Their founders (also PMs) realized that success follows transparency. You, your stakeholders, and your team need to have the right information at the right time. Idea Management is one of Leantime’s core differentiators. Every day, countless great ideas are lost in hallways, coffee kitchens and cantinas. 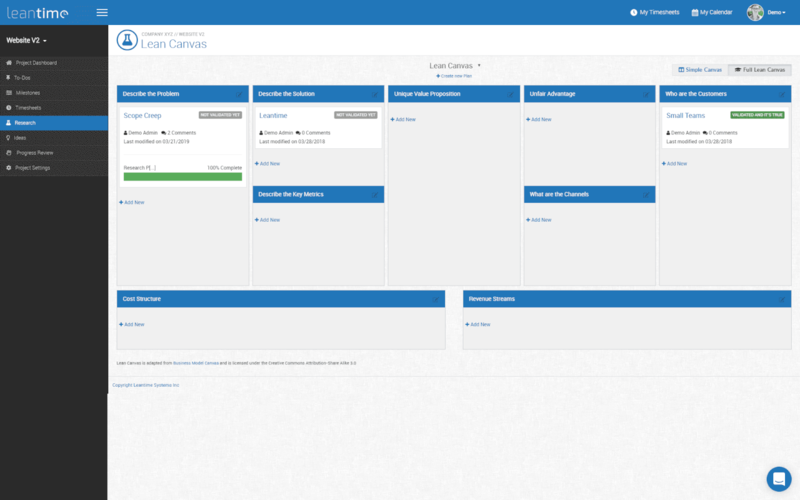 Leantime’s Idea Board is designed to help you keep track of those brilliant Aha! moments and lets you share and collaborate on them with your team and stakeholders. Your workflow is made simpler when everyone can manage and comment on ideas when your project needs it. Prioritize, manage, collaborate and plan your ideas from inception to delivery. Great ideas are the core of a lively company culture but formalizing ideas and breaking them down into small components can be tricky. These small components are necessary, however, to move ideas into real workable projects. This is why Leantime has opted to follow their Idea Boards with Research Boards. Adapted from lean methodologies, Leantime’s Research Boards come in a Simple and Advanced view. The simple view helps you and your stakeholders find Problem-Solution-Fit. Building on top of that, the Advanced view expands your research to all aspects of the product development life cycle — this includes finding unique value propositions as well as defining costs, budgets and revenue streams. All the research in the world is in vain if you can’t plan the implementation and communicate a timeline that stakeholders will accept and that your team can accomplish. 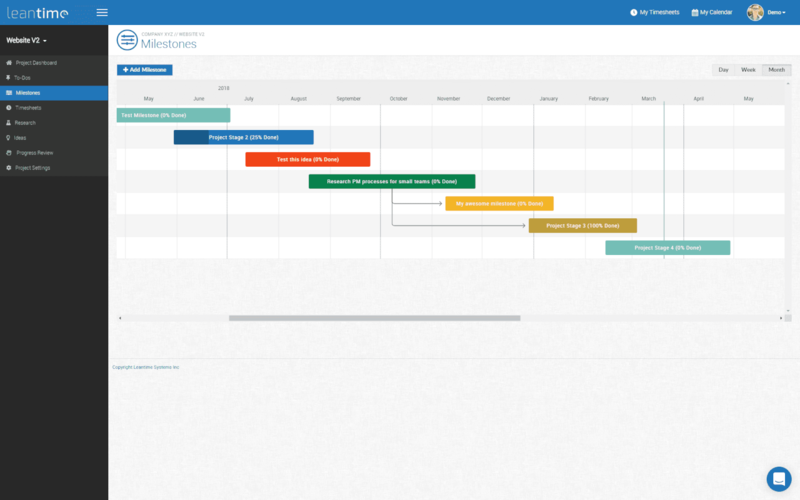 To help you plan, Leantime breaks down projects into milestones and on Gantt charts. These milestones are your defined attainable goals — breaking your project into phases with approximate timelines. As tasks are completed, each milestone distinctly visualizes progress. 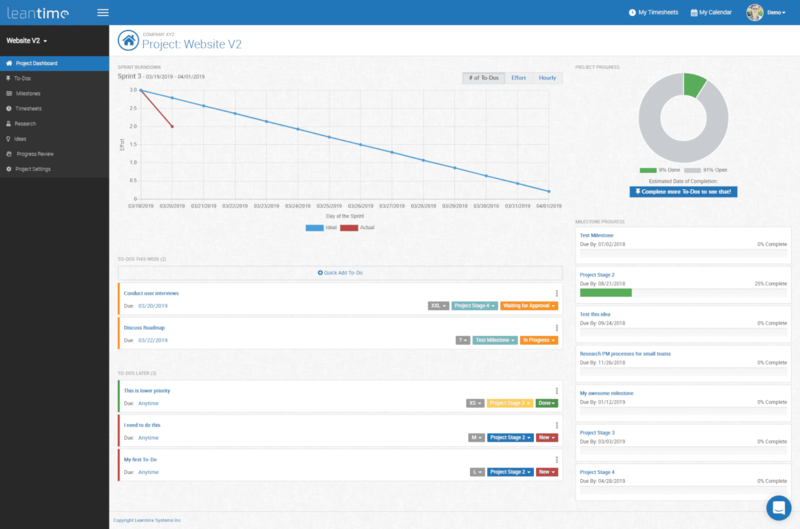 This can be seen on both the project dashboard and via milestone / gantt chart views. 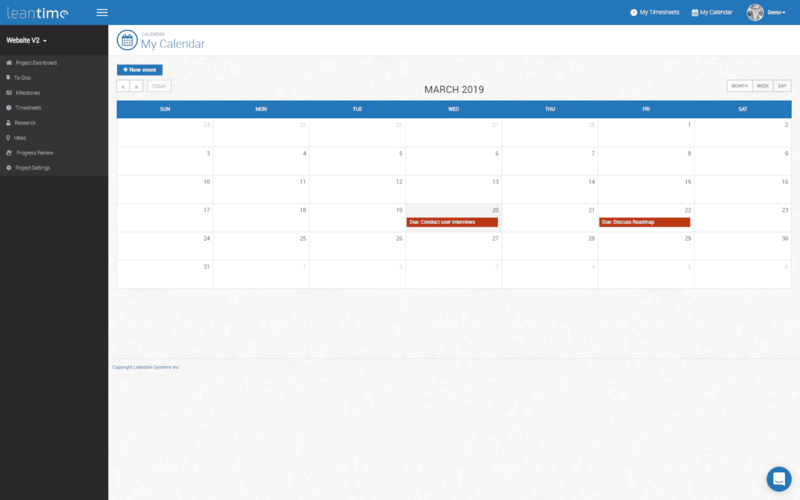 Utilizing these views allows you to manage and communicate possible dates of completion to everyone involved and hopefully eliminate those pesky status update emails. The bread and butter of every project is its’ tasks and its’ prioritization. An overfilled, unprioritized backlog is every project managers worst nightmare. 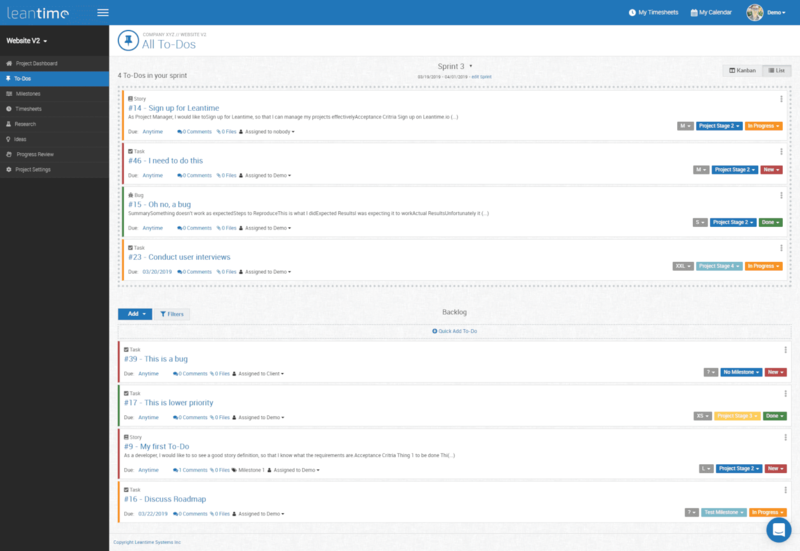 Leantime’s To-Do manager makes progress tracking as well as To-Do prioritization simple by using Kanban boards alongside drag and droppable list views. Prioritize your tasks by effort and impact then assign them to sprints. The easy to use UI lets everyone on your team know about upcoming priorities so that you don’t have to answer the question: What’s next? Login, get the status, logout. Leantime’s Dashboard view will give you all the information you need to update everyone on the status of work and aid in closely monitoring your efforts. Here you’ll see a burn down chart, project and milestone progress as well as your To-Dos due this week. A key differentiator of this Dashboard is its’ “estimated date of completion”. Leantime’s algorithm determines the completion date of your project automatically using your teams velocity and by making predictions about future velocity. As you learn, so does Leantime — making both you and the system increasingly accurate in determining your project timelines. Part of adapting quickly involves knowing where your time is going and predicting efforts required for your project’s tasks. Leantime is one of the rare systems out there that allows you to manage Timesheets within your project management workflows. Knowing how much time everyone spends on certain tasks helps you to learn more about your team’s velocity and plan better around it. Team members can enter their work time via start/stop timers or enter them through personal timesheet screens. 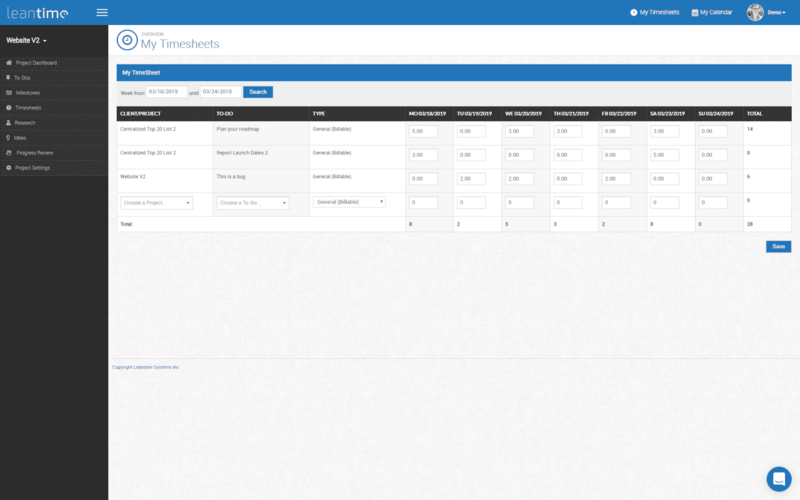 Managers can then run timesheet reports for sharing with stakeholders and clients as needed. Leantime integrates with Slack, Calendar, Dropbox & Google Drive so that you can continue to use your favorite tools and build on top the systems you’re already using. Even with all the best laid out strategies out there, project management is a balancing act. It’s the tightrope of competing agendas. Your job is to pull them all together and hit the home run necessary for everyone’s success. You’re the good guy trying to save everyone’s princess from big bad Bowser all at once. The more competing the demands, the more challenging it is to keep everyone on the same page. Leantime is here to support you in your efforts to save the day and make impact one project at a time. Simple Project Management — Starting at $5 per user per month, this plan has the basics to get you started. It includes all the features mentioned above minus the Idea & Research Boards. Starting at $10 per user per month, this plan is perfect for the team that needs the full product development lifecycle and is wanting advanced customization and white labeling. For those larger teams, this plan is perfect for on-site installation and its’ 24 hour customer support with onboarding and training. Contact for Pricing. *All plans offer a discount for annual payments. Marcel is a program manager and entrepreneur in the Bay Area with over ten years experience building and running technology systems. He has delivered software solutions as small as startup prototypes to multi million dollar projects. Throughout his journey as as manager and startup CEO, he has lead and consulted teams of varying sizes ranging from 5-50. He is a passionate advocate for User Centered Design, Lean Startups and Agile Methodologies.